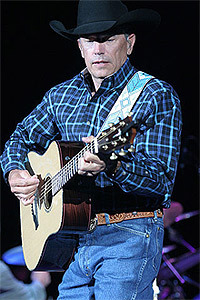 Country music icon George Strait, known for his honky-tonk, western swing, bar-room-ballad style of music, says the The Cowboy Rides Away Tour, will be his last! Strait has invited his favorite friends, to join him on his retirement tour. Strait rode to success in 1981 with his first hit “Unwound.” Since then, more than fifty of his songs like fan favorite, “Amarillo By Morning” have hit number 1. George admits his final tour will be an emotional one and notes that every city on the list holds fond memories. This will be your last chance to see the artist many call “King George” perform live! Order your tickets today. Tickets to George Strait are available for the following venues, dates and times. To sort the list, click on the column header. To find tickets for the given venue, date and time, click the tickets link in that row.